Home » Safer Homes » Best Coffee Maker for the Elderly: A Safe and Easy Cup of Joe! Best Coffee Maker for the Elderly: A Safe and Easy Cup of Joe! It is an American tradition. I know that my day hasn’t really begun until the first cup of coffee is made… and gone! It is no different for many seniors and elderly people. While the debate on the pros and cons of coffee drinking continue, many of these folks have been drinking coffee for 50 or more years. However, home coffee making becomes more difficult with weakness, arthritis, and dementia. And a senior’s safety in the kitchen becomes an important consideration too. Burns, spills, and leaving a coffee pot on all day causes multiple problems. Use this guide to find the best coffee maker for the elderly person in your life so they can continue this tradition – safely and easily. In a hurry? Here is a quick reference chart of my favorite easy to use coffee makers for elderly people. Or, keep reading to learn more about home coffee safety for seniors and how to choose your own coffee pot. When making a list of the best coffee makers for the elderly, I consider all of the above. Safety is the number one concern followed closely by ease of use. Ease of cleaning is a close third in my criteria. Below are some of the safest coffee brewers I could find, as well as some easy to use coffee machines as well that will suit any elderly person looking for a delicious cup of morning joe. 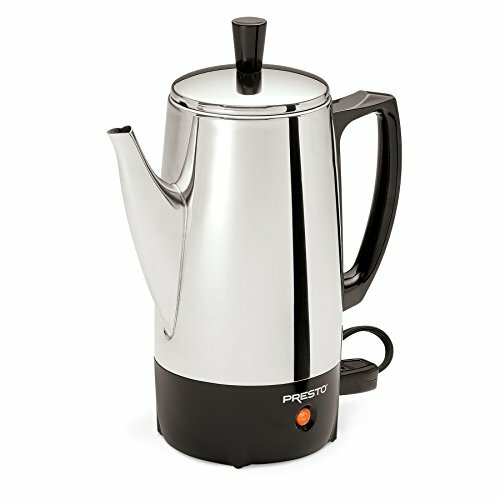 This small percolator coffee maker by Presto is both safe and simple to use. To make coffee with this machine, load coffee into the basket and screw the lid back on. Then simply plug it in and coffee will be ready in 4 to 5 minutes. Once the brewing is complete, the cord can be detached and taken to a table for serving or simply left on the counter top. It has a 4 cup capacity and is constructed out of durable stainless steel. It even has a “stay warm” feature that keeps your beverage nice and warm for hours, along with a cool touch handle so that you can safely pour your warm beverage. The lid knob with rolled edges ensures safe and easy handling. Percolators are safe coffee brewers and easy to use, but do require a little effort to clean. The internal brewing parts must be removed, cleaned, and reassembled after each cycle. This may be difficult for someone with arthritis or Alzheimer’s so it may require the help of a caregiver. 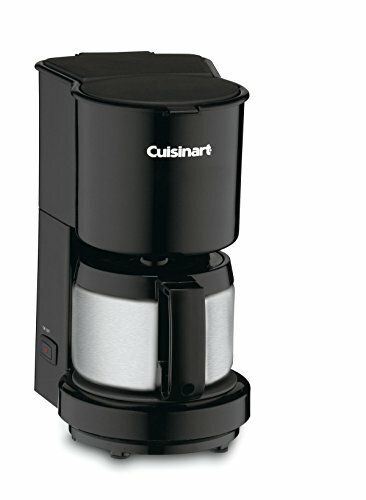 This 4-cup capacity drip coffee brewer from Cuisinart has nearly everything I look for in a coffee maker for an elderly person. First, it has several important safety features like auto shut-off and a stainless steel carafe. Second, it is simple to use with one on/off switch to operate – that’s it! It also has the brew pause feature for pouring a cup during the brew cycle without dripping, and it even comes in two colors – black and pink. The elder should be able to add coffee and water to the coffee maker to use this one independently. Or have a caretaker who can assist. One thing this coffee machine lacks though is a timer to automatically start brewing. This is the best coffee maker for the more independent senior. 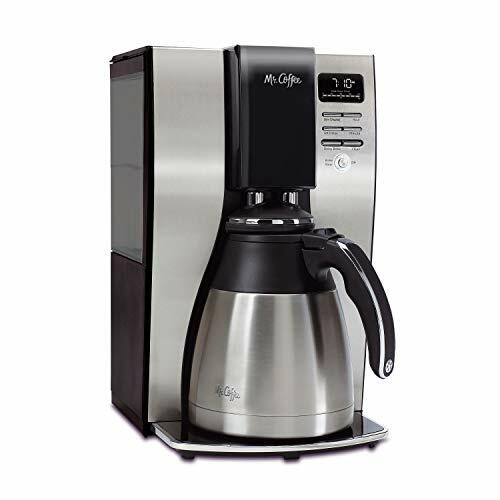 This coffee maker from Mr. Coffee has tons of features – most of which are beneficial to elderly and seniors. That’s why it I also recommend it as the best drip coffee maker for seniors. 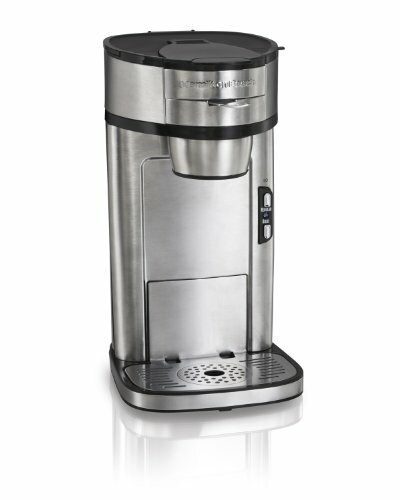 It has the recommended safety features like auto shut-off and stainless steel carafe. The carafe also has a thermal element that holds the temperature and fresh flavor for hours. This maker is also easy to use with a start button that is labeled “Brew Now”. It is also easy to fill with a reservoir that lifts off and is filled right at the sink. No more spilled water while pouring it in the coffee maker. This programmable drip coffee brewer is programmable to start brewing at a certain time, also known as a delayed brew feature. This is helpful to seniors because the caregiver can load it up in the evening and have it programmed to start at a certain time in the morning for the senior. Then, the senior will have coffee ready for them in the morning without having to do a thing. Very helpful for dementia or Alzheimer’s patients who may have difficulty loading a coffee maker. It also brews coffee up to 20% faster than its competitors, and it brews at 205 degrees Fahrenheit for the richest taste possible. The “Gold Tone” permanent filter is eco-friendly and cost effective, yet effective at removing 97% of chlorine for a great cup of coffee. This is the best easy coffee maker for elderly who just want a quick single cup of coffee in the morning. It is safe to use, easy to use, and easy to clean. To make coffee, simply use the built-in combination scoop and filter basket to scoop up your favorite coffee. Then place the scoop right in the top of the machine and add water to the back. The brewing is started by touching one of 2 buttons: regular or bold. That’s it. In 90 seconds, the senior will have a hot cup of coffee. Of course, a caregiver could pre-load this coffee machine too. That way, the senior or elder would only have to hit the button to start. Either button will start the machine so there is no concern about them messing up the brew cycle. Also, because it uses ground coffee, there are no expensive pre-filled filter cups or pods to buy. 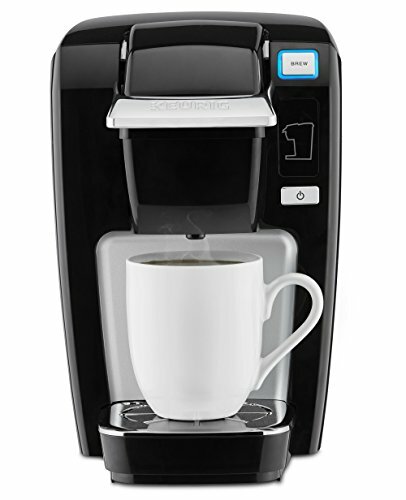 For the best simple coffee maker, the Keurig brewers are hard to beat. No messy coffee to scoop or wet filters to deal with. Simply pop in a K-cup, add water, and hit the brew button. That’s all it takes to make a delicious cup of coffee in the morning. Most seniors and elders are able to follow this process of coffee brewing. For those that have difficulty, a caregiver can assist and have the machine loaded and ready to go for them. That way, all they would have to do is hit the brew button. This particular Keurig is very compact in size, so it’ll fit on any countertop. This is also great because it’s not daunting to a senior. You can brew anywhere from a 6 ounce to 10 ounce cup. A 6 ounce cup will come out bolder in flavor (since they all get the same amount of coffee grinds in the prepacked k-cups. The removable drip tray is also great for easily cleaning up any potential spills, or accommodating a taller mug. It also comes in 5 fun colors to match the senior’s personality! A small warning, though. Keurigs are simple but more costly than other coffee brewing methods. The coffee machine will be higher in its initial cost and K-cups have to be continually purchased, as one pod equals one cup of coffee. Probably not a major factor for the purpose of this guide, but I wanted to mention it in case that’s a concern for you. Generally, coffee making is a safe and routine event. But, when weakness and memory issues begin to arise with elderly and seniors, there are a few things that can go wrong. The coffee maker is left on. If the senior forgets to turn the coffee maker off and it sits all day, the coffee can become a baked on, burn mess. This is also a potential fire hazard. The carafe gets dropped and broken. If the senior drops the glass carafe that came with their coffee maker, it may break causing a mess or even burns to the elder. A full carafe of coffee can weigh 3 lbs or more. Cleaning up the mess is a chance for cuts and injuries. The bending over required for clean up also creates an opportunity for a fall. The controls become difficult. For seniors and elderly with dementia or Alzheimer’s, today’s coffee makers can be very confusing. All those buttons, switches, and settings that we use to get our perfect cup will lead to confusion and frustration. among elders. Filling the coffee maker becomes confusing. Sometimes, it is difficult for seniors to load the coffee and water into a coffee maker. This could be caused by arthritis or just not understanding the proper way to do it. What is the Best Type of Coffee Maker for Seniors? The answer depends on what problems the senior is having while making coffee. Though, in general, the best coffee maker for seniors is one that they can use safely and easily understand how to use. Auto shut-off. Look for a coffee maker that automatically shuts off after a certain period of time. With this option, no one has to worry about turning the maker off after their morning brew. Stainless steel carafes. Choose a coffee maker with a stainless steel carafe instead of glass. Glass will shatter if dropped onto a hard surface. Stainless steel coffee carafes will dent at worse. Many also have lids that attach to them reducing the chance of a spill and are insulated to keep coffee hot longer. Simple controls. For most seniors and elderly, you will not want a coffee maker with a lot of buttons. A simple on/off button and maybe a timer button. That’s about it. The fewer settings and options the easier the machine is to operate. Brew timer. A coffee maker with a timer is a good idea for seniors who have caregivers or live with family. The caregiver can load the coffee and the water into the coffee machine and set the timer. Then, the elderly person can have their coffee at their usual time each morning with no effort at all. Being a bit of a coffee snob myself, I know that there are thousands of coffee makers out there. Some are simple and easy to use and there are some that look like a chemistry experiment from middle school. NOTE: I am not going to get into a discussion of which type of coffee maker makes the best coffee. While I have some definite opinions on that subject, it is beyond the scope of this coffee maker guide. This is the standard coffee maker of the American kitchen today. You will see one on nearly every countertop. These coffee machines heat water up to near boiling then drip it through a filter basket of ground coffee. The coffee then drips out of the bottom of the basket into a carafe. They may or may not have a heating element to keep the carafe warms. Most automatic coffee makers are ok for seniors and the elderly to use as long as they understand how to put the coffee and water into the machine. Many of these coffee makers have extra buttons and features the senior may not need as well. The best drip coffee makers for seniors are simple automatic coffee brewers like the ones above. Make sure the senior understands how to add coffee and water to the machine or has someone to help. These are available in small sizes too like 4 cup and single-cup machines so that a full pot doesn’t get wasted each time. This is the standard coffee maker of days gone by. I remember my grandfather making coffee on the stove with a percolator coffee maker. What an awesome aroma. But, enough about me! Percolators work by heating water up in the bottom of the pot. This is done on a stove or some have built-in heaters. This builds up pressure which pushes the hot water to the top and back down through a basket of coffee grounds. The coffee returns to the bottom where the cycle repeats. Percolators are typically pretty easy to use. The most difficult step is putting the coffee in the basket and getting the lid back on. Once that is done, it is just a matter of starting the cycle. For elderly and seniors, I would recommend a model with a built-in heater. It is best to not add the stove to this equation which is just an extra step and an invitation for injury. Percolator coffee makers are a bit more difficult to clean. This type of coffee machine is just what it sounds like: a coffee maker that makes just one cup at a time. The more famous model of this type of coffee maker is the one that uses the little white cups. There are also models of automatic drip makers that make smaller batches and even single cups of coffee too. Generally, the single serving style is the best for the elderly and seniors. Especially ones that live alone. Many of these are easy to use. Another advantage is that they make smaller batches of coffee. Making a full 12 cup pot of coffee is wasteful to many seniors and elderly. A drawback to these, though, is they may be a little more expensive to operate. Buying loose coffee is much cheaper than buying the cups. These machines will also cost more up front. But, most are easy and safe to use. There are many other kinds of coffee makers. Some of these may work for some elderly and seniors but not the group as a whole. Exotic sounding coffee brewers like french press, Moka pots, Pour Over coffee machines, and Vacuum pots sound cool. You will get a great tasting cup of coffee out of these methods of making coffee, but not easily. Most of these coffee making methods require multiple steps and careful observation. These methods are just too complicated for elderly people who just want their morning cup of coffee and will not be considered here. Obviously, a freshly brewed cup of coffee is usually served piping hot. Water does have to be boiling hot before being made into coffee, after all. Typically, coffee is served at around 160 to 185 degrees Fahrenheit. Unfortunately, that temperature can be dangerous for elderly people, as it can easily burn sensitive skin in and around the mouth. However, no one wants a lukewarm cup of joe right? Ideally, the safest coffee temperature for seniors is about 140 degrees Fahrenheit (give or take a few degrees). This temperature is warm enough to make the coffee enjoyable, but not scalding hot. Of course, you could always opt for iced coffee as well, and never worry about the burning temperature issue. So, Which Coffee Maker Do You Think is the Best Choice for the Elderly? Independence in the kitchen is very important to most seniors. Being able to cook for and feed yourself is a basic human need. But, it is also very important to make sure kitchen tasks are safe. That’s one reason items like this make great gifts for fathers and grandfathers and the senior women in your life too! Coffee makers are one choice of tool to improve kitchen safety for seniors. Other tools you may want to consider are can openers for people with arthritis. For seniors with weakness or arthritis in their hands or arms, lightweight cookware is an important step to keep elderly active in the kitchen. Automatic and manual jar openers are tools that are extremely helpful as well. Consider the type of coffee mug the senior is using also. Generally, I recommend lightweight mugs that don’t tip easily with large handles. Check out some of my favorites by clicking here. Leave a quick comment below and let me know what your choice for best coffee maker for the elderly is! Did you choose one of these or a different one? Let me know which one and why! Hello Scott, First of all, I want to thanks for such an informative article. It was a great experience for me to learn about these coffee makers for seniors. In your article, one sentence that really hit home was “Starting your day with a good cup of coffee shouldn’t be risky or difficult!”. I really love this. Best of luck. Take care. Is there a safety mechanism in place for those who are distracted and forgetful? It’s possible to remember to put the coffee into the filter, the water into the pot and then forget to place the carafe underneath. Does the coffeemaker have a mechanism that will prevent it from brewing if the carafe is not there? May sound like a dumb question, but I almost did that this morning.